The National Federation of Independent Business (NFIB) has endorsed Congressman Tom Emmer (MN-06) for backing Main Street businesses in Congress. Congressman Emmer earned the endorsement based on his voting record in the 115th Congress on the issues important to small businesses, namely health care, regulation and taxes. This is the third endorsement for Emmer by the NFIB. Washington is a flurry of news – ongoing negative coverage on the President’s historic meeting with North Korea, Majority Leader McConnell’s decision to cancel the Senate’s August recess due to unprecedented Democratic obstruction of the President’s appointees, and Nancy Pelosi raining on America’s LOW unemployment parade. Meanwhile, over in the House of Representatives, I’ve been hard at work on the Financial Services Committee to continue delivering relief to Main Street. Getting S.2155, the most significant rollback of the Dodd-Frank Act in nearly a decade (which included my Home Mortgage Disclosure Act) across the finish line was a major accomplishment, but it was just the first step. Last week, the Financial Services Committee unanimously passed a new bill I introduced, the Main Street Growth Act, 56-0. It’s not every day the other side of the aisle agrees with Republicans, but some solutions are so common sense, there’s no question. Minnesota Police and Peace Officers Association (MPPOA), the oldest and largest police organization in the state, has endorsed Tom Emmer for the U.S. House of Representatives as he seeks his third term to represent Minnesota’s Sixth Congressional District. The Association also endorsed Emmer for Congress in 2016. In addition to the MPPOA endorsement, Emmer has also been endorsed by the Sixth District Republican Party of Minnesota and the U.S. Chamber of Commerce. Congressman Emmer is currently serving his second term and is on the Financial Services Committee. Emmer is also a Member of the Republican Deputy Whip Team and the House Republican Steering Committee. In January 2017, he was appointed a Deputy Chair for the NRCC. Learn more at EmmerforCongress.com. 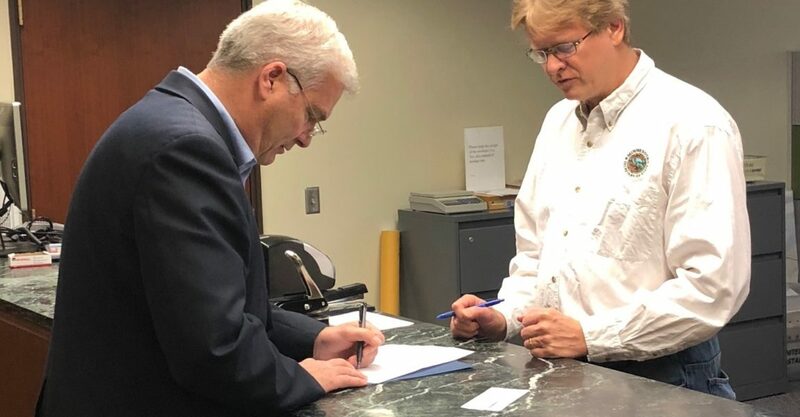 Today Tom Emmer filed for reelection with the Minnesota Secretary of State to run as the Republican-endorsed candidate for Minnesota’s Sixth Congressional District. Emmer is seeking his third term in the U.S. Congress. “It has been an honor to serve and represent the people of Minnesota’s Sixth Congressional District,” said Emmer, who was unanimously endorsed by Sixth District Republicans at their April convention. “Together we have accomplished so much, from the largest tax cuts in over three decades to the most significant regulatory relief in nearly a generation. But there is more work to be done to keep this economy moving forward and ensure every citizen of this nation has the opportunity to achieve their American Dream. I am ready to continue representing central Minnesotans and bringing Midwest values to Washington,” Emmer concluded. Emmer won the 2014 congressional election with over half (56.3%) of the vote. He then went on to win 2016’s election with nearly two-thirds (65.6%) of the vote. Yesterday, the U.S. House sent the largest pro-growth, deregulation bill in decades to President Trump’s desk. Today, I was fortunate to be at the White House and watch as he signed it into law. 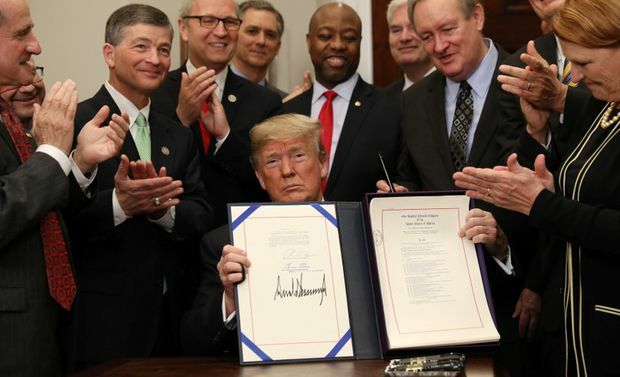 S. 2155, the Economic Growth, Regulatory Relief and Consumer Protection Act will roll back some of Dodd-Frank’s most harmful regulations to small financial banks and credit unions. The bottom line: Dodd-Frank did not work. Both chambers (and both sides of the aisle) agree that the “one size fits all” regulation style from Washington has done little but destroy economic potential and left Main Street – quite literally – to pay the price for a crisis for which they were not responsible.